why arent all antenatal courses just like this! Top quality antenatal education I can do at my pace in my own space. Love it! If you are feeling any of these then you have come to the right place. If then you are very much normal! If you ask most women in the street how they feel at the thought of giving birth, the comments are most likely to be pretty negative. Everywhere you look the image of giving birth has become a pretty scary one that understandably can make you feel worried about how you will cope. 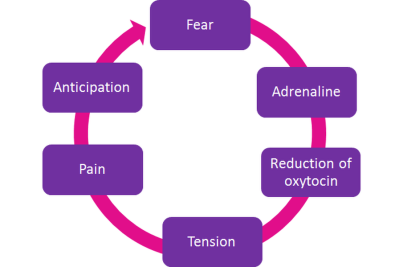 As you can see here, the big problem with feeling that fear and anxiety is that it actually prevents your body from being able to birth in a calm relaxed way and keeps you in this cycle of fear, tension and so pain. There is so much information out there and so many different classes but very few of them help you to really tackle the big issue of how to get rid of the fears and worries and how to really work with your body rather than fight it (more of that later). Want to know how Hypnobirthing works? So in answer to the first point, would you call the Duchess of Cambridge or Greg Rutherford the hippy dippy types? Didn't think so! They both used hypnobirthing so to put your mind at rest - you do not have to be a hippy or earth mother (but great if you are), do not have to have a natural birth and with this course you most definitely do not need to use any silly words that make you and your partner feel a bit uncomfortable! Asal in Germany recently did this course and she did far from an earth mother, hippy dippy type!
" Your online course is brilliant!. The content is excellent: comprehensive, detailed, interesting and in bite sized modules. It strikes a great balance between the science and the art of birth. Compared to other hypnobirthing classes, yours is a lot more comprehensive, detailed and user friendly." What hypnobirthing techniques can I learn? If you are serious about preparing for birth, then you will be joining over 100,000 women who have already used the techniques in this course. Once you understand the nitty gritty of why these things are so important, plus you then learn really quick and easy ways to achieve them, everything else begins to fall into place. In addition, you will learn how to manage and change your thought patterns to help achieve deep relaxation (mind over matter) plus you will learn how to use the state of deep relaxation to work with your body during contractions which by default will reduce the degree of pain you feel. b) to help dad / partner to feel really helpful and useful rather than a spare part! 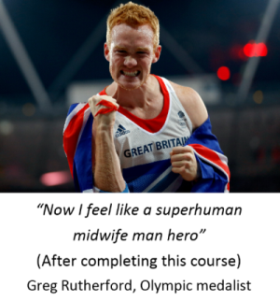 "This course should officially come recommended with all hospitals, midwives and antenatal classes throughout the UK"
If you are unable or would prefer not to do a face to face course, then the old phrase any time, any place, anywhere will be a welcome thought. No matter where you are or where you are planning on having your baby, this course will take you step by step through everything you need to know and do, to help you stay calm, focused and in control. 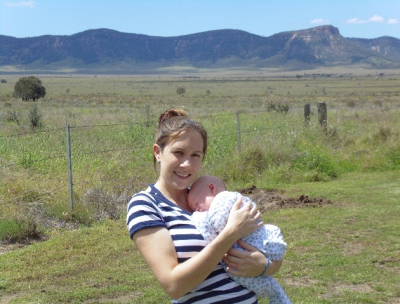 Recently, Nicole who lives in the outback in Australia used this course for the birth of baby Cade. She is 2 hours away from her nearest antenatal class so this course was perfect for her. She had a really tough time with her first birth so was desperate to have a better experience this time round. "Doing the online course was one of the best decisions I have ever made! It gave me a really good understanding of my body and birth and gave me the confidence to trust in my body. I was really able to enjoy the whole thing as I felt so in control, was totally able to cope with the pain and keep a level head. Even though I was induced I was able to do it all without any pain relief. Even my obstetrician commented on how well I was doing. After the birth I felt nothing but pure happiness. I couldn't wait to tell my family and friends how wonderful my birth was - I even described it as blissful and immediately after I said to my husband I definitely want to do this again!!! Thank you Maggie for your amazing course and your support. Even though we never met I felt like I knew you and your voice instantly calmed me when I put my ipod on. I cannot recommend this course highly enough, I think this preparation is crucial for the best birth possible!!!!" What is in a hypnobirthing course? What will I get out of it? - 8 hours of multimedia and interactive tuition with Maggie Howell - now if you were to have that face to face with that would alone cost you £400. - 4 hypnosis downloads which sell for £40, which includes one for your birth partner to listen to . 5. A guide for your midwife including a data sheet on how they can best support you, the research to back up the claims, sticker to put on your birth notes, door sign for the birth room and more. So how much will the hypnobirthing course cost? The cost of the course is £120, but really its an investment in you, your partner and your future baby. So give yourself the best chance of having a birth that you can enjoy, look back on with pride and feel good about birth, start this course now.